Simulation and other studies were done by Boston Consulting Group for the World Economic Forum. Their study contains some interesting conclusions about shifts in urban traffic in several cities. Their first research was based on cities remaining pretty much as they are, but gaining use of robotaxis, robocars, shuttles and other new tech. The conclusions included parking being reduced by 50% but only a 4% reduction in travel time. In particular, the reduction in travel time came from a fairly large reduction in travel time in the 'burbs, but a slight increase in travel time in the downtown core due to people switching from public transit to robocars and increasing congestion. They also did calculations if some factors such as ride pooling and congestion charging were used to stop that extra congestion, and got overall positive results in that case. This study still suffers from fairly conventional thinking -- the real future is not going to look too much like today -- but still has some value. Displacement of driving jobs came up twice on the agenda -- first in a talk by Erica Groshen of Cornell who previously was commissioner of the Bureau of Labor Statistics, and then during a session in our "Shark Tank" breakout in the afternoon. 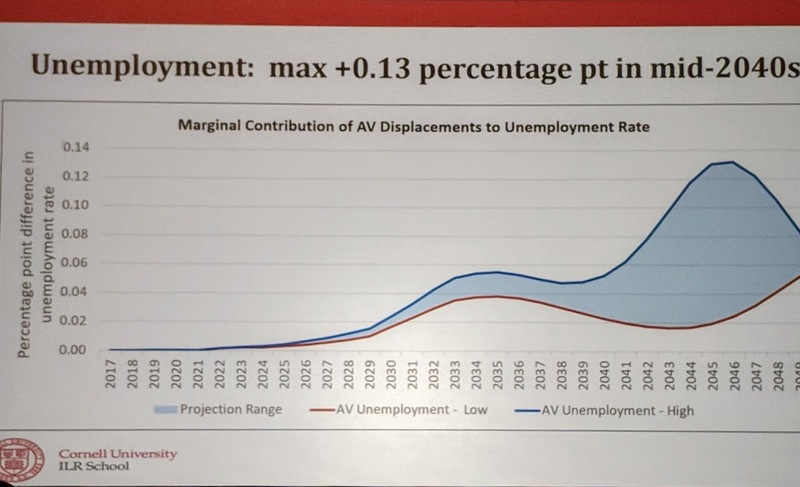 The outlook was surprisingly positive, with projections that the stories of massive disruption due to millions of unemployed truck drivers are overstated. In reality, even the worst case situations increase total unemployment by about 0.1%, and in should actually be much better than that due to turnover in the trucking business. Still, the political blowback presents a problem because people are much more afraid of the problem than it warrants, and that will drive public reaction and votes. As such, this might be a good place to prepare mitigation strategies in advance, including retraining and even direct compensation for career truck drivers who are put out of work and can't find anything else. It might not be too expensive to due this because the number of jobs lost may be small. Chris Gerdes, formerly of Stanford CARS, expanded his talk on real ethical issues. Like me, he feels the trolley problems are silly and very distracting, and wants a focus on real everyday problems. We don't want to try to program software to make ethical decisions. Instead we want to train programmers on how to have good ethics when they code, says Gerdes. As an example, he showed an intersection where a woman stands at the brink of a crosswalk, but she's not moving. As you get closer you see she is talking on a cell phone and thus not about to enter the crosswalk. Challenges here include recognizing that, and also deciding how much to slow when approaching before you figure it out. If you slow too much, you block traffic. If you slow too little, you may have a problem if she does enter the crosswalk. Heidi King is a deputy NHTSA directory who has been nominated to be the next director. Her talk on Thursday morning was mostly expected material (as was the one from secretary of Transportation Elaine Chao) though it reflected the changed thinking at NHTSA that came with the change of administration, namely that they no longer feel they (wisely) should do much to regulate a technology which is yet to be deployed. I saw a strange contradiction in her words. She gave a strong voice of support to DSRC (the 5.9ghz car to car communications protocol) which is only to be expected from NHTSA. But she also admitted that the FCC's request to get the spectrum back (because automotive use just hasn't materialized) was legitimate and must be worked with. Then she said that she felt cybersecurity was a major issue, and NHTSA wanted to promote extensive efforts on cybersecurity by all players. The contradiction is that many computer security experts would say the most assured path to cybersecurity is to minimize communications to what is necessary, what I have called The Disconnected car. That's quite at odds with constant car communications with randomly encountered other vehicles and infrastructure. To put it a new way, if you were to look at any other class of dangerous infrastructure like power plants or military assets, people would view it as ludicrous to suggest, or worse, make a legal requirement that the core control computers of these facilities all be on the internet and communicate constantly with unknown parties. Yet this is what NHTSA has said for cars, except rather than the internet, it's an open radio network over which there is even less control. NHTSA is taking comment now on removing regulatory barriers. Their first plan is to update the petition process for getting an exemption from the Federal Motor Vehicle Safety Standards. The FMVSS are full of rules written for cars with human drivers, and new and unconventional vehicles can't readily comply with them. Recent legal changes vastly increased the number of exemptions that can be granted, enough so that you can deploy a serious fleet, at least for now. On a nice not for me, King started her talk by speaking positive only the "Pizza delivery robots" that run around her home in Washington DC. These don't necessarily carry Pizza, but they are our robots from Starship Technologies. Did they say anything about why they think the job losses in trucking will be considerably less than expected? I mean, the theory that there'll be such losses seems pretty straightforward. Namely, once you have an economically beneficial autonomous truck, it won't take decades to switch over, but since it's economically beneficial for the owner to do so, will happen very quickly across the board. Only thing I can think of is they expect a human watchdog in such trucks to be required for quite a while. You can read their paper for full details. For my own analysis, considering that there are 250,000 unfilled trucking jobs, the first 250,000 jobs to be replaced will be ones that nobody actually has. And then, since there is sometimes turnover in longhaul trucking of over 100%, the next million jobs to be replaced will come from those. Eventually, the career truckers will start to lose positions (though probably not that fast as the economy grows and new people decide not to enter a declining profession.) A large fraction of them will move into other tasks than driving, such as fleet supervision and non-driving operations (only half of a typical truck driver's job is driving.) The rest will move into non trucking positions. Only a few will strictly "lose their job." The largely underutilized urban rail lines could be embedded within a road and opened up to autonomous vehicles, perhaps exclusively large freight and autonomous buses. Vehicles could be registered with the signalling system and allowed into the coridoor when appropriate. Similarly busways are underutilized, perhaps these could also be used for autonomous freight, with registration required in order for the truck to identify itself as autonomous to avoid a ticket. I have proposed that for a long time. In fact the trains are inefficient enough it is debatable if the expensive rails should be kept.